DELICIOUS SHRIMP MORSELS WITH CUCUMBERS, SCALLIONS AND ASIAN NOODLES RECIPE. Delicious variation of shrimp with fresh scallions and cucumbers. Simple to prepare. 1/2 pound shrimp, shelled and cleaned, cut into bite-sized morsels. You can use cooked or leftover shrimp, just heat, not sauté. Pot to cook udon noodles, mixing bowl, bowl large enough to hold all ingredients, sauté pan or wok to warm or sauté shrimp - if large enough you can finish the dish in the wok. AT LEAST 30 minutes before serving, mix together in a small bowl the vinegar, soy sauce, 1 TBSP sesame oil, garlic, ginger, hot pepper and sliced scallions (you can also add these at last step, if preferred) for marinade. Allow to stand. PREPARE sliced cucumbers and shredded carrots. IN 1 TBS sesame oil warm or sauté shrimp morsels. DRAIN noodles. Combine cooked noodles, spring onions, cucumber, carrots, and shrimp in large bowl. Pour marinade with rest of ingredients over noodles, mix well, serve. Garnish with sesame seeds if desired. 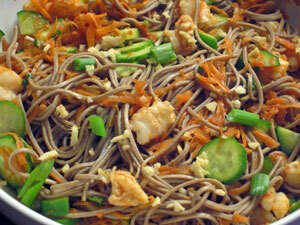 ALTERNATE: If using wok, add drained noodles to cooked shrimp, sliced cucumbers, shredded carrots. Add marinade, mix well and serve.